Understanding Electrolysis - Romeo's Marine & Autobody Ltd.
Reduce the corrosive effects of dissimilar metal galvanic corrosion on expensive and critical boat parts. Eliminate electrolysis that stems from being the “ground” for another boat or an entire marina because of wiring defects. Protect persons and equipment from damage because of lightning. 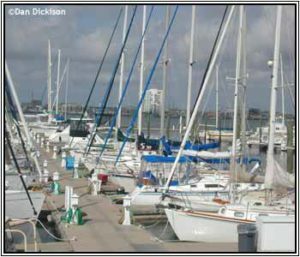 Crowded marinas like the one above present ample opportunity for electolytic problems stemming from anyone’s use of shore power. Electrical systems are built on the concept that electricity sent out on a wire from its source to utilization equipment for whatever purpose must have a return path to the power source. In home-based electrical systems, there is always a hot wire and a neutral wire. Aboard a boat, there should be red positive wires and black negative wires. In an automobile, one wire feeds a device and the frame of the vehicle is often used to complete the electrical path back to the ‘grounded’ battery wire.Comparatively speaking, seawater is a pretty good conductor of electricity. So all the underwater exposed metal parts of your boat are essentially electrically connected to all the underwater exposed metal parts of any other boat or boats within a reasonable distance. (A conductor’s ability to pass electricity is greatly reduced by distance, and that holds true whether its wire or water doing the conducting.) So think of these nearby boats as being in contact. It’s somewhat akin to the example of dissimilar metals that I mentioned above. A mistake or fault in the wiring that supplies power to your boat, the marina docks, or any of the other boats nearby could cause a difference of potential between the submerged metal parts in your boat and the submerged metal parts connected to the faulty wiring. With good old seawater completing the circuit between these metal parts, accelerated corrosion will occur at one or both of these metals parts because of the forced migration of electrons or metal ions. 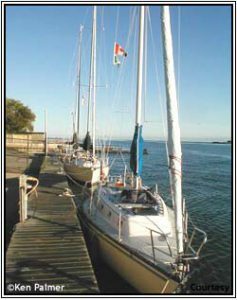 (If the metals are different, it’s galvanic action, which we covered last month; the forced difference of potential in this situation we define as electrolysis).If you thought the corrosion from dissimilar metals was easy to fix, the stray currents that threaten your boat’s metal parts are even more easily handled. You’ve already taken the first step by bonding all of the metal components of the boat. Now, assuming that your electrical wiring is installed according to the National Electrical Code, the DC wiring is grounded to the bonded metal system created by connecting everything metal together. The AC wiring must also be bonded to this system to assure the proper operation of the over-current devices that protect crew and equipment aboard. Always check the polarity of shore power before connecting your vessel to the power. Check it separately, or install a polarity indicator on the line feeding your panel from the plug mounted on your vessel. Have any polarity discrepancy resolved before connecting and running your boat and its equipment. Install a properly wired ground plate or ground shoe on the exterior of your hull. The purpose of this component is to provide a reference point that connects the entire ground system to a single potential (the surrounding seawater). This ground plate is something that’s required for proper lightning protection, so I’ll offer more specifics on it when I cover that topic in a future article. Install a galvanic isolator in the ground wire between your vessel’s panel and the shore-power plug on your boat. This is a device that will not allow the small destructive current to flow on your AC ground wire (and your bonded ground system), but will carry the large surge current of a fault, allowing the overcurrent protection device to open the circuit and protect your life and property. We now have protected the vessel from corrosive destruction caused by chemically generating its own voltage (dissimilar metal corrosion) or conducting stray voltages at your marina. By implementing these fixes, you’ll have a head start with lightning protection, which I’ll discuss in my next article. If you look closely, you’ll see that this boat’s owner has clipped a wire to the shroud base; the end in the water has a sacrificial zinc attached. 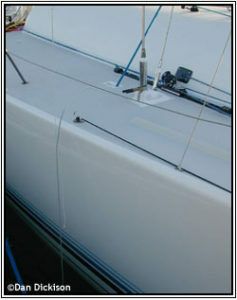 This is a common practice among racing boats that aren’t otherwise fitted with zincs to deter damage from electrolysis. Unless it’s properly protected and connected, the shore power cord plugged in on the left side of the dock can lead to problems for all of the nearby boats.